Curry powder adds a sophisticated twist to this fruit and veggie salad, along with an anti-inflammatory boost. Perfect for brown bag lunches and picnics, this salad goes well with grilled or cold chicken. 1. In medium bowl, stir together mayonnaise, lime juice, lime peel, and curry powder. 2. 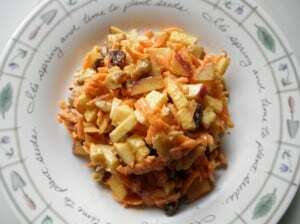 Add apple, carrot, walnuts, and raisins and stir to combine. Nutrition information (per serving): Calories 168, Carbohydrates 20g, Fiber 3g, Sugar 13g (added sugar <1g), Protein 2g, Fat 10g. This Week’s Podcast | Are Grains Really Necessary? Looks great, and I will be trying it later today. You comment on it’s “anti-inflammatory boost”, it would be great if you would also give an IF rating to the total recipe. Thanks. I am going to make this tonight, sounds very refreshing. I’ll be subbing the mayo (gross) for greek yogurt. Other carrot salads I’ve had really benefitted from finding the freshest, sweetest carrots. So, depending, this may be better as a seasonal recipe. Luckily, where I am, we have fresh and local produce available just about year round. Trade off for the traffic… I guess… Thanks.